This high power brushed DC motor provides high speed and torque in a standard 130 sized motor package. 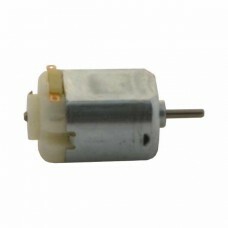 This motor is a drop in replacement for standard 130 sized motors of the same operating voltage. It is optimized to run at voltages from 1.5-3V. When operated at 3V, it spins at a fast 17,000 RPM while drawing about 250mA free running. When stalled, it draws 3.85A with 0.75 oz-in of torque.